This is my new table! You will die, guess how much I spent on it! He gave me this mirror for FREE! the beveled corners are perfect and the aging is awesome! but a deal is a deal, I was beyond excited! These pictures are really bad from my phone camera but you get the Idea…. 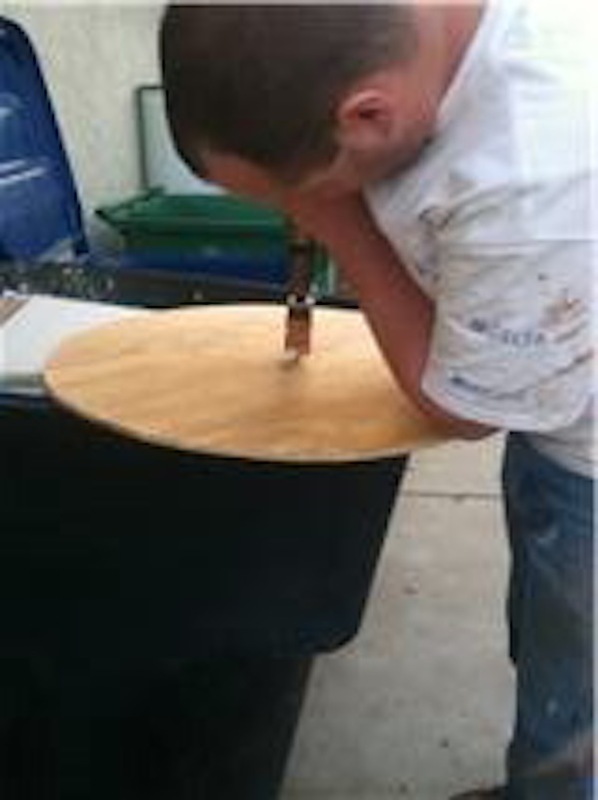 My hubby used a hole saw to drill a hole in the middle of the plywood that fit perfectly over the table base (you can see in the picture below how there is a small circle that sticks up above the table), after he had cut a piece a plywood that is the same shape of the mirror I had picked up! screwed the plywood on top of the table base, using four screws. Then used Liquid Nail to get the mirror to stick to the plywood. The hubby then used “c” clamps to make sure the mirror was on really good. This Mirror is AMAZING! I am LOVING it! The aging of this mirror is PERFECT! You can see the plywood is under the mirror. What do you think about my $10 table? I love it! How perfect. Te he quedado muy bien. Estamos celebrando el dia del blogueros y pasa a retirar un regalito de recuerdo de este día 20,03 2011. What a great idea, it looks amazing! What an amazing find, and combination! There’s nothing better than finding two unconnected pieces that seem made for each other. Absolutely beautiful! That IS cute! Great job! Great job, great deal. Love the combination.